Most of my conference and user group talks can be found in this GitHub repo. 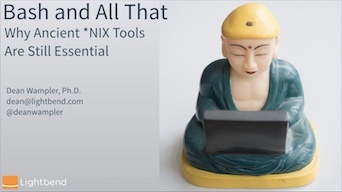 A celebration of the UNIX philosophy and the tools it spawned. The JVM is the standard platform for Big Data and Scala is emerging as the standard programming language for Big Data Developers, driven in part by Spark. What lessons can we draw from this picture? My talk at the Walt Disney Company Meetup in London. 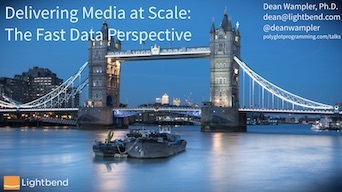 This talk is similar to the Executive Briefing above, but shorter and focused on the media streaming use case. 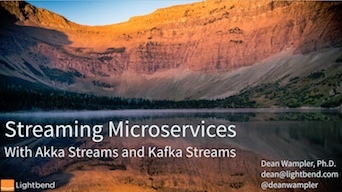 Spark, Mesos, Akka, Cassandra, and Kafka form the basis for new, flexible architectures for Fast Data and Microservice applications. This talk describes the characteristics these applications need and how the SMACK combination meets those needs. Spark 2.0 introduces significant improvements and refactorings. This talk summarizes the major changes. 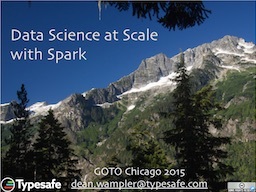 Spark has emerged as the replacement for MapReduce in Hadoop applications. This talk explains why. 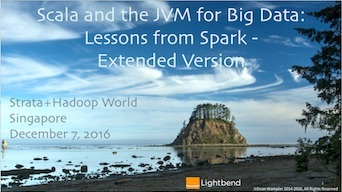 While Spark is now popular on Hadoop, managed by YARN, it emerged as demonstration project for Mesos. 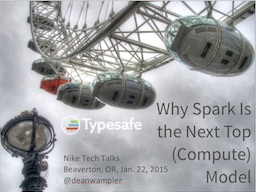 This talk explores Mesos, compares it to YARN, and argues for why you should consider a Spark + Mesos cluster. 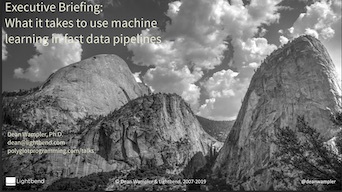 Using examples, I show how to use Spark for Data Science at scale in ways that were previously not feasible with other tools. Why Scala has proven so effective as the general-purpose programming language for Big Data development. 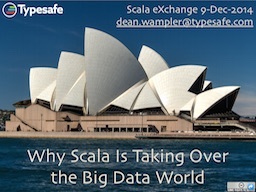 Scala has emerged as the de facto language for big data development, driven in part by tools like Scalding and Spark. 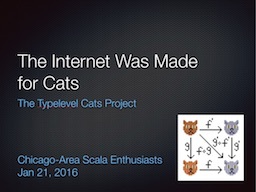 My informal introduction to the Typelevel Cats project, including why I think it's model for open-source development. React London 2014 and YOW! LambdaJam 2014. 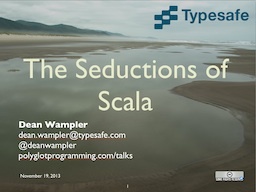 The Seductions of Scala . I've given this presentation now at several venues. It provides a short introduction to some of the seductive features of Scala, like Traits for Mixin Composition, succinct syntax, and support for Functional Programming. An overview of the Akka Framework for building robust, highly concurrent servers in Java or Scala. Note: This is a web-based presentation written using S5 (with hacks). See the instructions on the GitHub page. Why Spark Is The Next Top (Compute) Model . 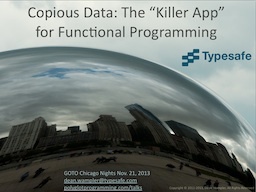 Copious Data: the Killer App for Functional Programming Video. 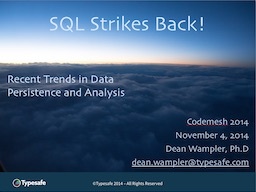 Relational databases fell out of fashion with the rise of NoSQL and Hadoop. But SQL proved too useful for too many people, so there are now many SQL-based query tools for Hadoop and subsets of SQL on several "NoSQL" databases. This talk discusses this trend and why it started. 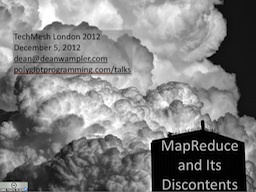 CodeMesh London , November 4, 2014. 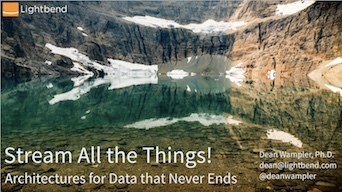 H2O is a high-performance, clustered compute engine for data science that fills an underserved niche in the Big Data world, working with data sets under a few TBs in size, which is just too big or too slow for a single machine to process, but not big enough to require Hadoop. This talk discusses why H2O is such a good fit for this niche. Big Data Techcon San Francisco 2014. 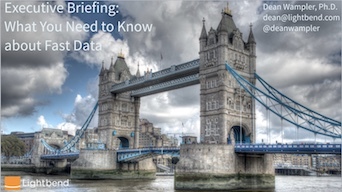 What's Ahead for Big Data? I've been doing Hadoop-related consulting for the last year. Data analysis and processing is a perfect application of Functional Programming, yet a Java-centric, object-oriented mindset pervades that community. 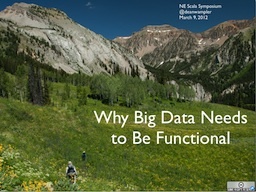 So, I did a 30-minute talk at the NE Scala Symposium on Why Big Data Needs to Be Functional. You can also find the video here. 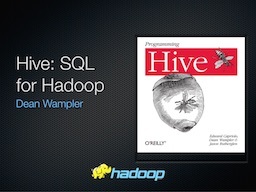 This talk for January, 2012 meeting of the Chicago Hadoop User's Group introduces Hive and explains why it's a key technology in the Hadoop ecosystem, primarily because it makes it easier to transition SQL-based data warehouses to Hadoop. 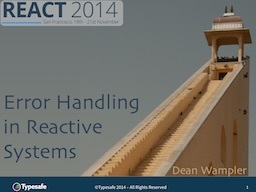 Error Handling in Reactive Systems . 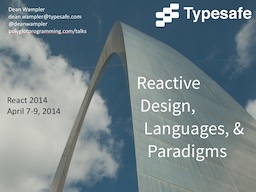 Reactive Design, Languages and Paradigms Video. (Son of) Better Ruby Through Functional Programming and Better Ruby Through Functional Programming . 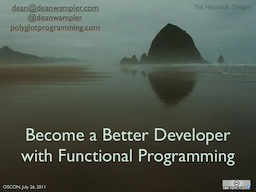 An updated and the original presentation I've given on applying functional programming ideas to Ruby development and how they improve your code. I gave the original talk at RubyConf 2008 (video) and the "Son of" talk at Windy City Rails 2009 (video). Note: the code samples are availabe here. A tutorial that Aslak Hellesøy and I did August 27, 2009 at Agile 2009. 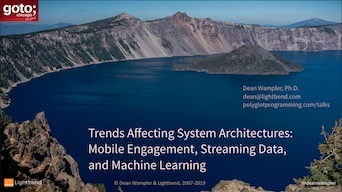 A talk I gave at Dr. Dobb's Architecture and Design World 2008. It discusses object-oriented and functional design principles that promote smaller, higher quality Ruby code. I don't discuss the "obvious" stuff, like how to use Rails, gems, JRuby, etc. Rather this talk is based on the premise that a successful architecture must be based on a foundation of good OO design, with a healthy dose of ideas from Functional Programming, Aspect-Oriented Design, etc. Feedback is welcome! This short talk (30 minutes) presented Aquarium to the aspect-oriented programming research community at the Aspect-Oriented Software Development 2008 Conference, in Brussels. The talk was based on my Industry Track paper. Note that some of the Aquarium APIs have changed since this talk and paper were prepared. A few years after I started my evolution from thinking in objects to thinking in functions, it occurred to me that our ideas of what's good and bad in software development have often changed. 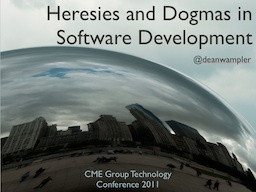 Today's dogma is tomorrow's heresy, if you will. So, I gave a talk on this idea at Strange Loop 2011 and subsequently in other venues. Five ideas in the history of software development that were once (or still are) popular, but now are (usually) seen as obsolete (plus a "bonus" topic). The video of the Strange Loop talk is on InfoQ. 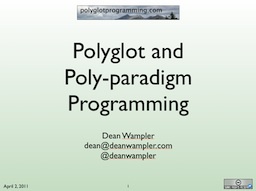 I've done a series of talks on the theme of Polyglot and Poly-Paradigm Programming, where I discuss how using multiple languages and/or "paradigms" can simplify the solutions to common problems we encounter today in software developer. How do you keep systems and architectures "clean"? 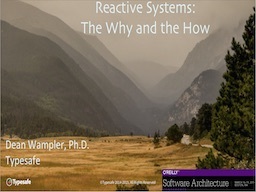 This talk is based on the "Clean Systems" chapter I wrote for Bob Martin's new Clean Code book. Don't Do This! How Not to Write Java Software . In this JavaOne 2009 talk, I discuss 10 mistakes I see Java teams make, why they are bad, and what to do instead. I discuss some of the academic research and industry trends that led to the creation of AOP, the current state of things, and how both can contribute to the future development of AOP and emerging technologies that might use it. This is an introduction to AOP, given as a presentation at the Chicago Java User's Group, Sept. 6, 2007. I discuss why AOP is interesting, what problems it solves, followed by a look at how aspects can be implemented in AspectJ and Spring AOP. I then look at several object-oriented design principles adapted to aspects and, along the way, demonstrate fine-grained separation of concerns using AspectJ. Aspect-Oriented Design Principles: Lessons from Object-Oriented Design ( on the AOSD 2007 Conference web site). An examination of 11, well-established OOD principles and how they apply to AOD. The main objective of this paper is to address pragmatic issues of designing production-quality aspect-based software. In today's world, aspects won't prosper unless they promote agility, reusability, and maintainability. The 11 OOD principles discussed have proven to be effective design tools that promote these qualities (especially in languages like Java, C#, C/C++, etc.). I discuss how the principles apply to aspect software, how AOD refines them, and how they lead to new aspect-specific extensions that promote better aspect design. This paper is part of the Industry Track at AOSD 2007 in Vancouver, BC. An introduction to Contract4J and how to use it. The article also briefly discusses some emerging ideas about the nature of interfaces in Aspect-Oriented Design, and how Contract4J demonstrates some of those ideas. The Challenges of Writing Reusable and Portable Aspects in AspectJ: Lessons from Contract4J . Writing Contract4J revealed many of the challenges faced when trying to write generic, reusable aspects in AspectJ. This paper discusses those challenges, how they were addressed, and offers suggestions for improvements to AspectJ and our concepts of AOD that will make it easier to write reusable aspects. Presented at the Industry Track, AOSD 2006, Bonn Germany, March 22, 2006 (Click here to get all the Industry Track papers). Contract4J comes in two forms; an implementation where contract tests are defined using Java 5 annotations and a more experimental implementation where the tests are defined as regular Java methods with a JavaBeans-like naming convention. This paper discusses how these two forms define a protocol with two different syntaxes that allow aspects to advice objects with minimal coupling, in the spirit of interface design. Presented at the ACP4IS Workshop at AOSD 2006, Bonn Germany, March 21, 2006. Predictions about the likely future of AOSD, based on the history of OOP. The basis for this comparison is the conceptual parallels between the two technologies. The presentation also has a brief description of AOP itself. It ends with an appraisal of the current state of AOP and offers some recommendations for how to begin working with it today. Some preliminary work on Ivar Jacobson's idea of considering Use Case-oriented software development as a form of AOSD. An examination of how AOSD addresses some technical challenges in OMG's Model Driven-Architecture (MDA).